We recently received a question from a customer who had concerns about protecting sensitive information to certain members in a project, for example private financial data. Realizing that many of you may be concerned about the same issue, we’re taking the opportunity to clarify this. Getting work done means you have to open up your user data both within your organization or with other companies. We realize you may want to engage with customers and external business partners without sharing certain proprietary information. OneDesk’s security roles and permissions tools allows you to control what project members have permission to access. When you share a project with a user, you need to choose a role to assign them, based on how much access you want them to have within the project. 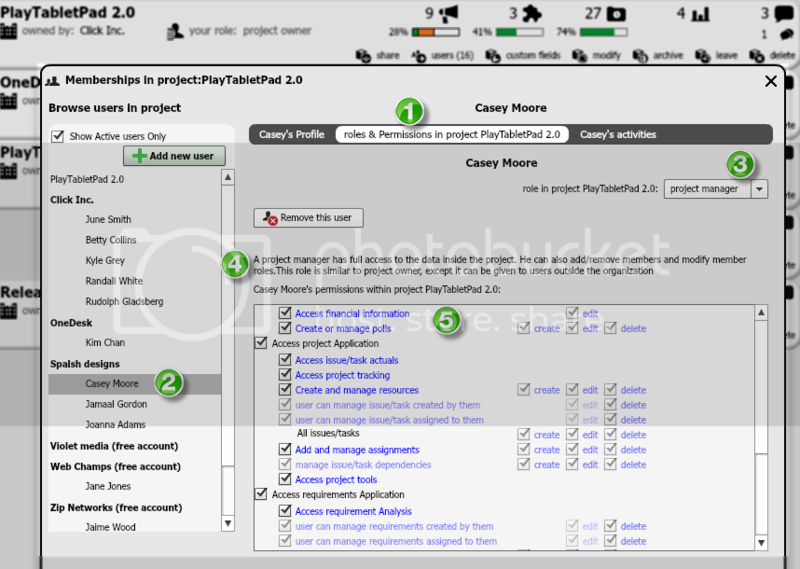 Roles may be changed anytime, however, only projects owners may edit user roles. To go the manage projects view (1). A memberships window will open up. Go to the roles and permissions view (1). In the left column, select the user whose role or permissions you would like to change (2). To change a user’s role, click on the drop-down arrow next to Role in project (name) (3). When you select a role, you will find its description here (4). User permissions are displayed in the form of a check list. Uncheck all items that you wish to restrict to the user from (5). We hope this clarifies your concerns. As usual, we invite you to comment with any feedback or questions.